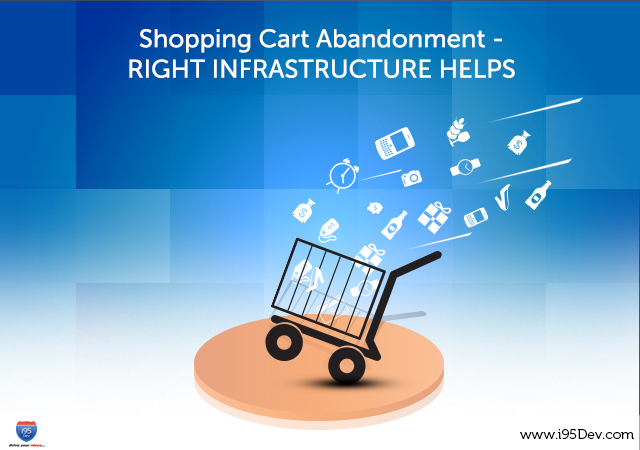 Shopping cart abandonment is slowly becoming a nightmare for ecommerce managers across the globe, they are lost sales opportunity. Online retailers often find a number of shoppers who add products to their shopping cart only to abandon it later. Customer adding an item to their online shopping cart is not an end to the sale, as it does not guarantee that they will continue with the purchase. By most studies, nearly 60%-70% of website visitors that add items to their shopping carts abandon without making a purchase. But then how you counter the problem? How do you ensure that your shopping cart abandonment rate is as low as possible? i95Dev team shares tips on how to prevent shopping cart abandonment. The first part of the series speaks volumes on how right infrastructure can change the course of your business by preventing shopping cart abandonment. Retailers invest a lot of money in marketing activities (including promotions, etc.) to improve conversions and often ignore basic things like ecommerce store design. While promotions drive sales retailers can also improve conversions with a fast and responsive website. Speed – A lot of users abandon store because they take too much time to respond and hence it is critical to check all images, text and tables and ensure that the page loads and responds reasonably fast. Responsive – Increasing number of customers today shop using their mobile device and to cater to their needs any retailer has two options. They can either invest additional resource, time and money building a website or app just for the mobile device or they can build a responsive website which auto adjusts its interface based on the device it is loaded on. A responsive design helps saving time and money and does not require retailers to manage and maintain an additional site specifically designed for mobile users. Call to action buttons play a crucial role in converting sales as they drive customers to perform an action (like checkout, express checkout, etc.). They often rely on their ability to stand out through visual appearance and placement. Hence to make these buttons effective and to drive customers to click on them, it is important to distinguish these using contrasting colors and creative designs and also strategically place them. Most retailers today invest a lot of time in building an easy to use and intuitive web store. But, no matter how much you invest you might always find some customer feeling lost and finding it difficult to locate the right product or information. These customers will often leave dissatisfied if not helped immediately. So how do you help them find the right information? Options like live chat support, toll free customer service numbers or even an email address they can write to can drastically improve the chances of conversion. Customers often (read always) get annoyed when they encounter an error during the checkout process and have to invest the entire effort again to make a purchase. In most cases customers will simply abandon their purchase to never return. No retailer will want to have an unsatisfied customer but how you handle such situations? While you would like to have an error free website there is very little that you can do to avoid them. But, what you can really control is what the customer experiences after the error has occurred. You can drastically improve the customer experience by saving the cart information and asking them to continue the purchase where from where they left. In the next blog of the series, we will look at few more reasons classified under “Give your customers Everything they Need” that will help retailers improve conversion and reduce shopping cart abandonment.